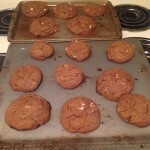 If you like chocolate & you like cookies, this is for you! Get ready to wear your favorite pajamas because when you try these chocolaty & spicy cookies, you’ll be ready to sleep the day away in heaven. It’s a simple addition to almost any chocolate chip cookie recipe that can take them to the next level. It’s time to turn a boring chocolate chip cookie into a quadruple chocolate chip cookie with a spicy kick. These cookies are amazing & something different that everyone will love. I like to serve them with blueberry pie & ice cream or even by themselves. Because they are dry, you can pair them with almost anything that is moist or wet like ice cream or cakes. Take the Ancho chili powder & hit it 8 times for some spice or 16 times for a real kick. The extra powders help make the cookie dry so the spice from the Ancho chili powder is able to come out after the chocolate taste is gone.